Dzoungdzi supports a population of fewer than 10,000 sophonts. 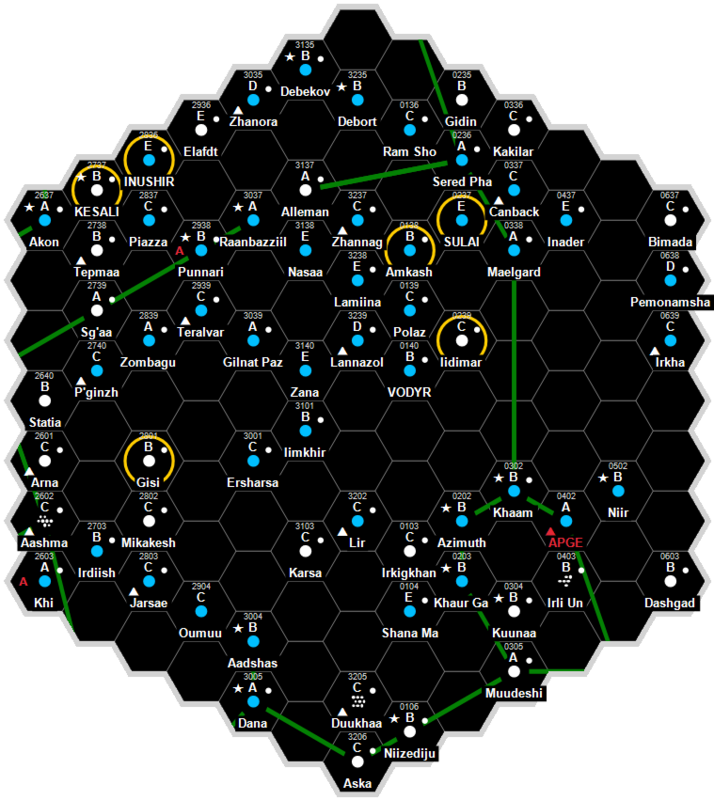 It is a Vargr dominated Non-Aligned world in the Antra Subsector of Deneb Sector. Dzoungdzi supports a population of fewer than 10,000 sophonts. It is a member of Wilds in the Antra Subsector of Deneb Sector. 100% of the world's population is the Major Race Vargr. Dzoungdzi was settled by several technologically focused groups of Vargr seeking to escape the tumultuousness of the Vargr Extents but not wishing to completely lose their racial heritage. Adjusting to the planet's dramatic temperature fluctuations was an early challenge. The hot summers and frigid winters and the rate at which these seasons fly by (about 11 days a season), not to mention the dramatic daily temperature fluctuations, put a great strain on the structural integrity of the materials used in construction. For the Vargr who lived on Dzoungdzi, Science had an answer for everything. And the most knowledgeable Vargr among them became the most charismatic. As such, they were the ones that had the best ideas for combating the problems of the day, and as a result the populace rewarded them with positions of leadership. Even disputes were handled in a gentlemanly manner. Both parties would agree to meet at the aenllarrghginksangluz, which roughly translates to "the public forum where we will debate and argue our cases," and the crowd would decide which side was correct. The rulings would carry the weight of legal proceedings and it freed up the courts to be concerned with more important criminal matters. It was a wonderfully polite little meritocracy, at least until the Assemblage of 1116 showed up. As Dzoungdzi prospered, word of its achievements spread. Human and Vargr alike were drawn here to hire the Dzoungdzians as consultants on projects ranging from civil engineering to cybernetics. The Assemblage of 1116 sent representatives here looking to find ways to improve shipboard energy weapon efficiency in return for protection from would be marauders. Whether or not the Assemblage intended to honor the agreement and not turn on the very world they offered to protect is subject to debate. The Dzoungdzians turned away the corsair state stating that they wouldn't work on military projects, beyond their own at least. The Assemblage did not appreciate the snubbing. As the year 1116 was drawing to a close, the Assemblage of 1116 invaded Dzoundgzi. Although Dzoundgzi's automated defenses proved quite capable, there simply wasn't enough to hold off the invasion. The Assemblage's forces killed all human offworlders and enslaved the native scientists. The Dzoundgzi were forced to work on military research projects or die. When failures occurred, the punishment was usually to have the next round of tests demonstrated on Dzoundgzi citizens. Communication breakdowns, political infighting among the corsairs, intentional procrastination on the part of the scientists and engineers, and a decrease in test subjects all kept progress limited to a slow crawl. After years of this, it was finally decided by high command that work on all current projects would cease and that all engineers and scientists would start working on a great robot army to send out against the humans. Construction of the robot army proceeded slowly due to supply shortfalls. As the Regency began to drive the Assemblage's forces out of the sector and destroy them, material and equipment deliveries were diverted, lost, or delayed. The workforce would be idle for weeks at a time. But before the robot army could be completed, the Assemblage crumbled. Aerlarz, the planetary governor, vowed to continue on with the project. When materials couldn't be obtained from the corsairs stationed at Fursuelgigz, Aerlarz sent scouts out far and wide to find them. The army was finally ready in 1138, though it was much smaller than initially envisioned. Unbeknownst to Aerlarz, the techies programmed the robots not to kill civilians, which they defined as anyone not holding a gun. Although they would probably be executed for this act of defiance, the techies would be able to die without the blood of innocents on their conscience. A convoy returning from a parts acquisition run to Fursuelgigz told of the carnage they witnessed. As far as they could tell, 20 minutes before jump all environmental systems at the starport simply failed. It was odd because communications still worked, judging by the telemetry they continued to receive until jump. The Imperial super computer virus rumors were known to all on Dzoungdzi. Just like the loyal vargr at Fursuelgigz, Aerlarz swore it was a Regency trick. Her staff agreed. This confidence wasn't completely shared by all the soldiers however and when they saw how afraid the native technicians were of this news, not to mention the fact that they believed the rumors, they grew uneasy. Shortly after the return of the convoy, word got to the techies from some sympathizers within the military. The technicians warned them not to allow the convoy's ships to be allowed to link up with the datanet. Of course it was already too late. The robot army came to life and began to gun down anyone with a weapon. During the ensuing chaos, the technoslaves were released from prison by the sympathizers and fled into the countryside. Every single corsair was killed, from the troops on up to Aerlarz herself. And when the robots were certain there was no one left, they committed suicide by blowing themselves up. In the years since their liberation, the Dzoungdzians have begun to rebuild their society. Although there is no central government, those with disputes still go to the aenllarrghginksangluz. Forays into the old city are made in order to find some item worth salvaging. The descendants of the scientists, engineers, and technicians still believe that science and technology hold the answers, though maybe not all of them. This page was last modified on 13 November 2016, at 12:03.